This beautiful dish has a flavorful combination of green beans, bell peppers, and chicken breasts. 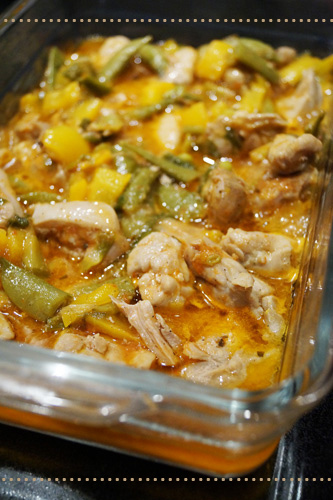 The recipe is healthy and versatile and makes a great low-carb main course. You can serve it with a crispy or green salad. And you can whip up this meal with parsley, creamy sauce, black olives or herbed mushrooms. It is easy to tweak and modify this recipe. This dish is quick and simple to make, budget-friendly, and so delicious. It has the right combination of nutrients for children and grown-ups. You will love this diet staple. Cut each chicken breast into cubes. Heat the oil in a skillet and cook the chicken pieces, until golden. Set aside. Cut the bell peppers lengthwise and combine with the green beans (you can use green peas instead). In a clean pan add 1 cup water, the cooked chicken, bell peppers and green beans, pepper, cumin, salt. Simmer (about 15 minutes) and serve.